Today it’s me here at Sew Ready to Play! I don’t think I need to introduce myself, do I? So we’ll skip that part and move right in to my project! We’re all pretty excited about how this one turned out! I’ve been wanting to make this for a while. 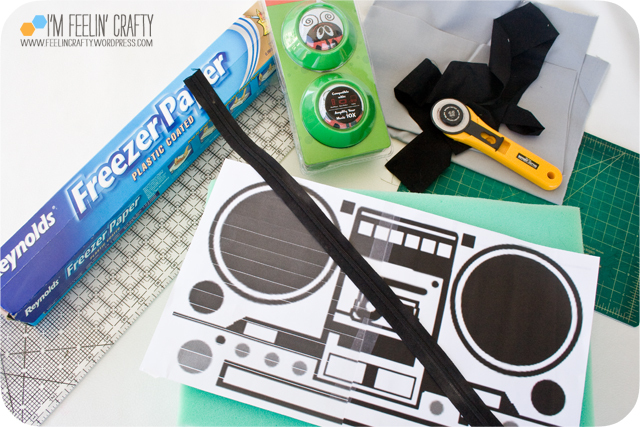 Maybe 2 years now… So when I was thinking about my Sew Ready to Play project, it hit me! Name that Tune is a game! We try to play it, but the kiddo always sings the same song and I’m horrible with song names! 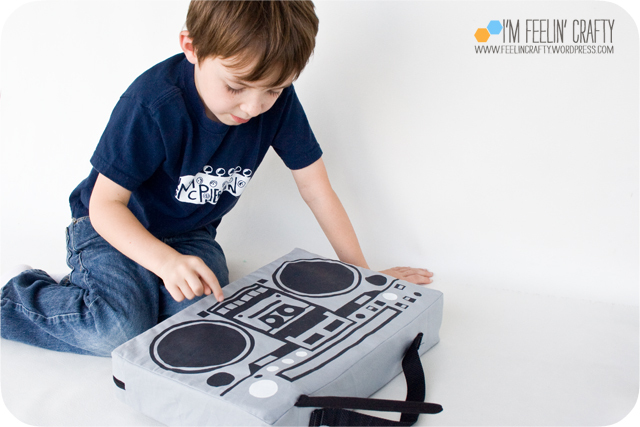 So it’s not our favorite, I’ll admit, but it’s a cool project!! It’s kinda a Land of Nod knock off. 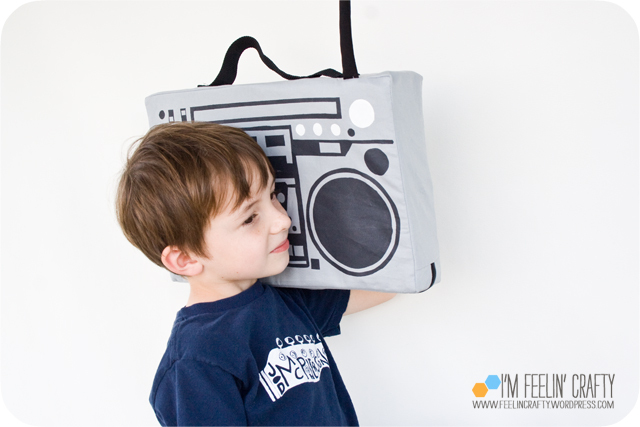 A few years back I saw that they had this boombox pillow (it’s not on their website anymore) and it was pretty cool. 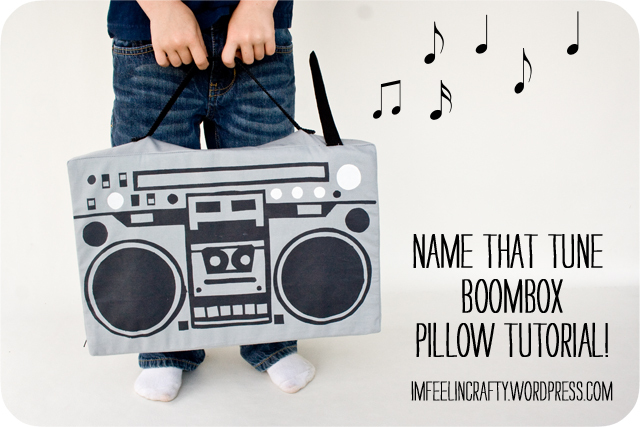 But it was just a pillow… Why wouldn’t a boombox pillow play music??? Our night time routine is typically a couple of books and then a book cd. 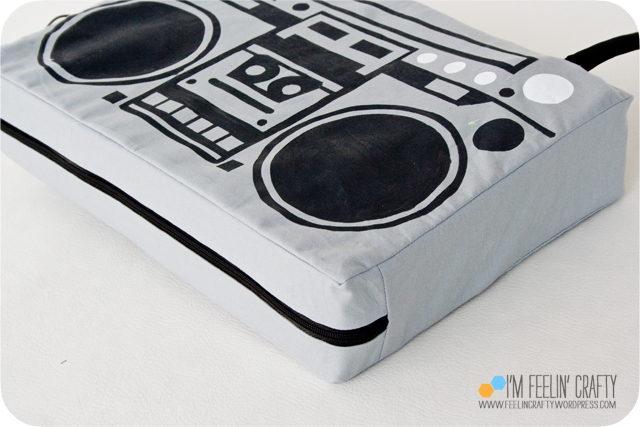 And I have a bunch of books on my iphone… So… Combine the pillow, cd’s and iphone and you have a perfect boombox pillow! Yep! Dad loves to fall asleep listening to the radio and I like to fall asleep to white noise after reading. Needless to say, we had a little problem. So I bought Dad a speaker pillow. It’s perfect! He can listen and I don’t have to hear it! 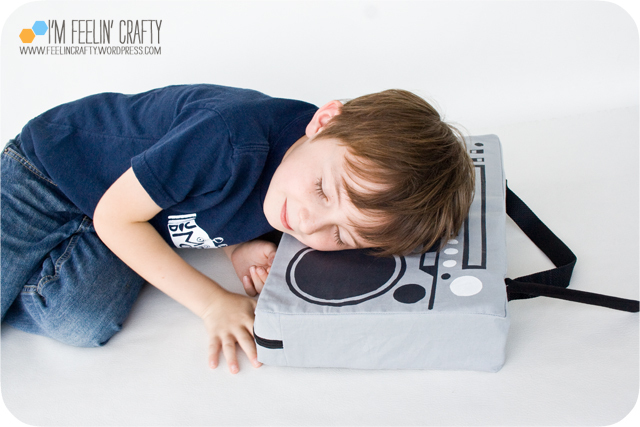 So the kiddo is super excited to have his own pillow so he can fall asleep listening to music too! Just like Dad! So I got to making my own! And it’s a hit! 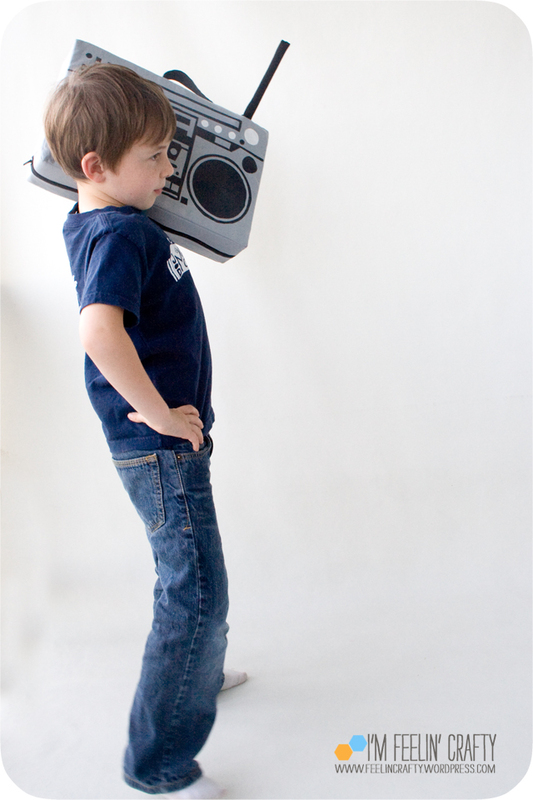 When he was modeling it, I told him, ‘Back when I was a kid, people used to walk around with them on thier shoulders.’ So we took some pictures and then a few minutes later he said, ‘Hey, let me carry it like they did in the old days!’ hmmmmmmmmmmm…….. The old days…. Really? 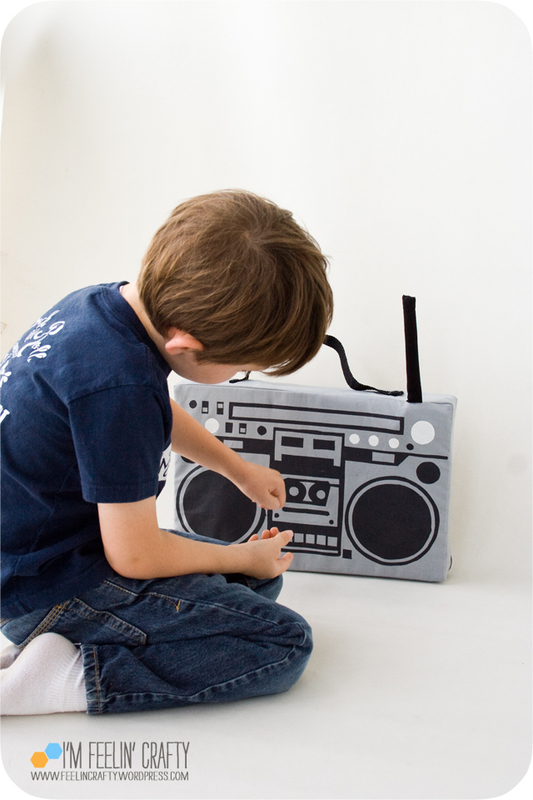 The pillow has real hidden speakers behind the stenciled speakers. 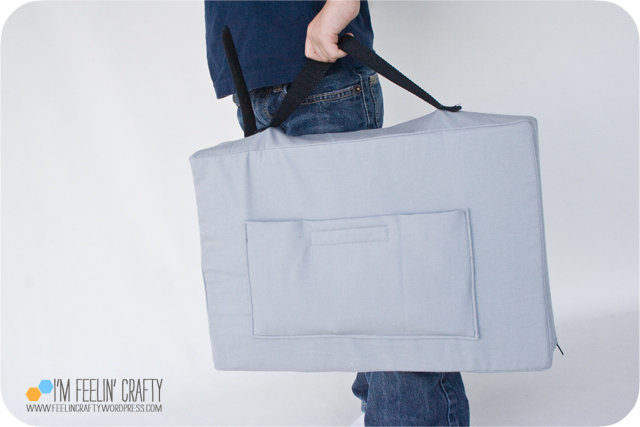 And a pocket on the back to hold the iphone (or mp3 player of your choice!). And a handle to make it easier to take to your next dance party!! OK! 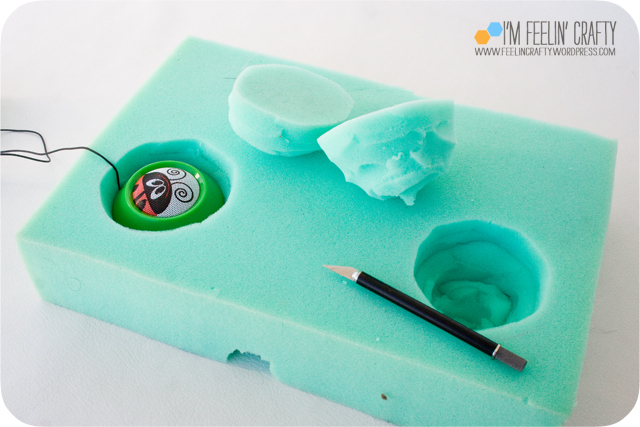 Does it look like so much fun that you want to make one? I’ll show you how! 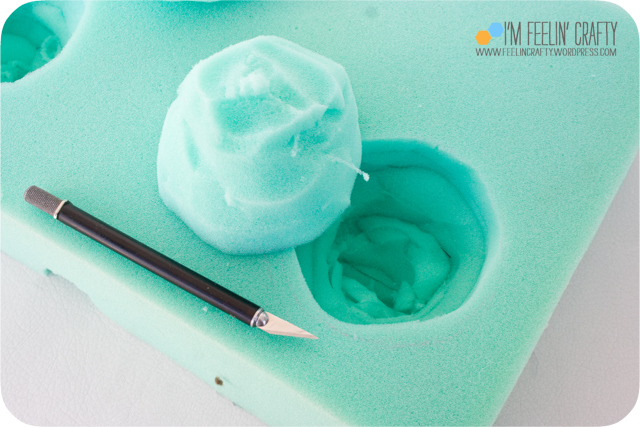 Your materials- 15x10x3 piece of foam (or how ever big you want to make it), you can use my template (but I warn you the file is very low resolution, but it works! 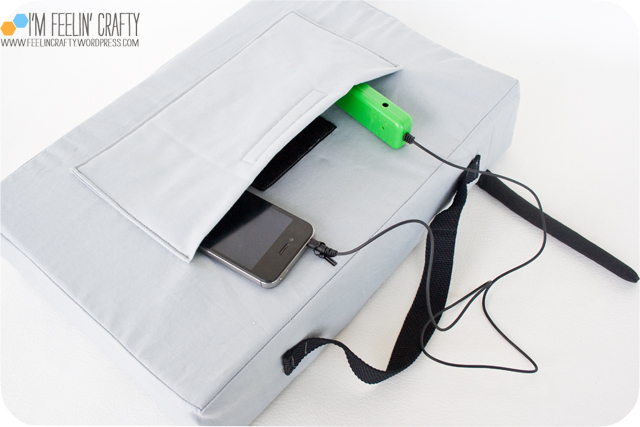 ), a zipper (I started with a 25 inch one), grey fabric, a little bit of black fabric, cutting supplies, speakers and freezer paper. And not shown in the picture, but I also used a scrap of interfacing, a scrap of batting, fabric paint, 3 inches of velcro and about 10 inches of webbing. 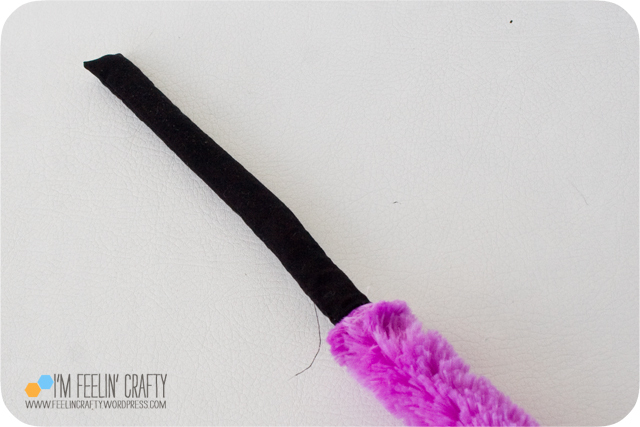 Also, I just happened to have a super big pipe cleaners for my ‘antenna’. But if you don’t happen to have those, I’d use a regular pipe cleaner wrapped in batting. 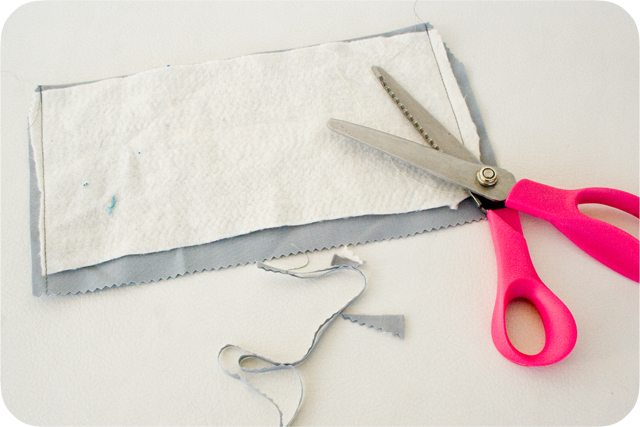 First, cut out your pieces of fabric. For my 15x10x3 pillow, I cut: 2 pieces at 16×11, a 4 inch strip about 40 inches long, 2 strips about 2 inches wide and 25 inches long. The pocket was a scrap about 10 by 10ish. 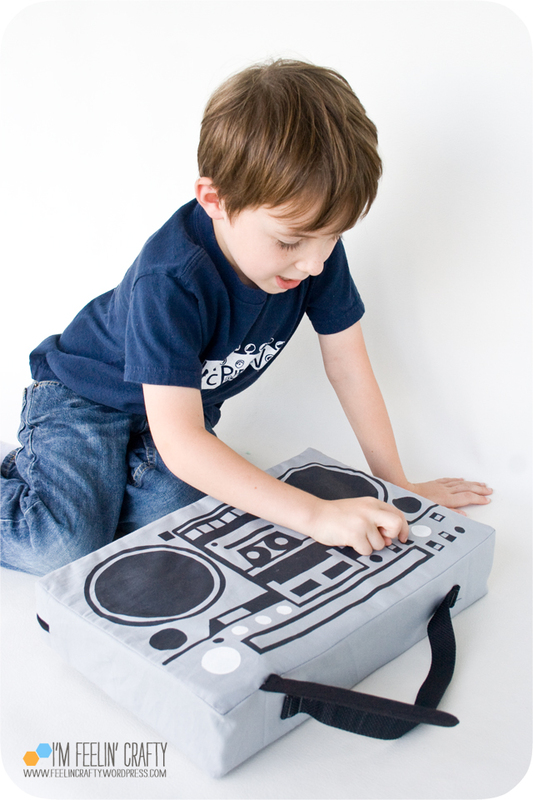 The pocket really just needs to be big enough to hold the mp3. 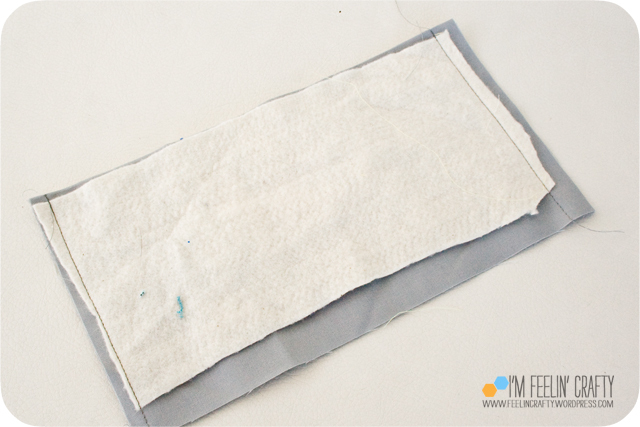 Cut out the pattern in the freezer paper, iron it on and then paint it. 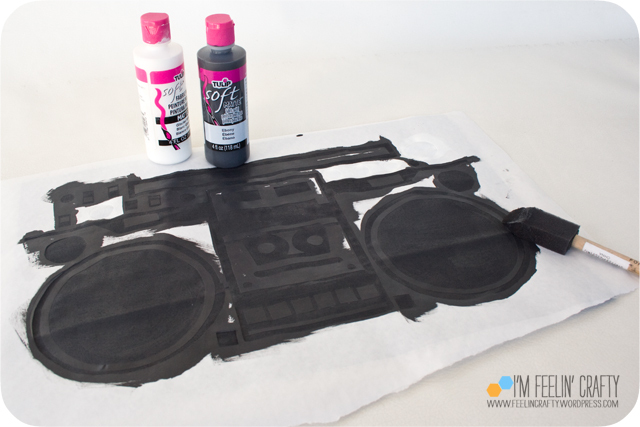 For more freezer paper stencils details see this tutorial! Next we’ll prepare the back. 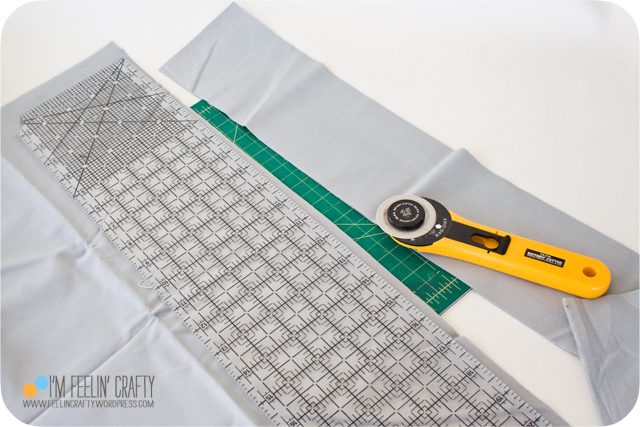 Iron on your scrap of interfacing. I made mine centered and down just a little bit. Then draw on a rectangle, mine was about 3 inches long and 1/2 inch tall. Cut the inside lines, but not the outside rectangle. 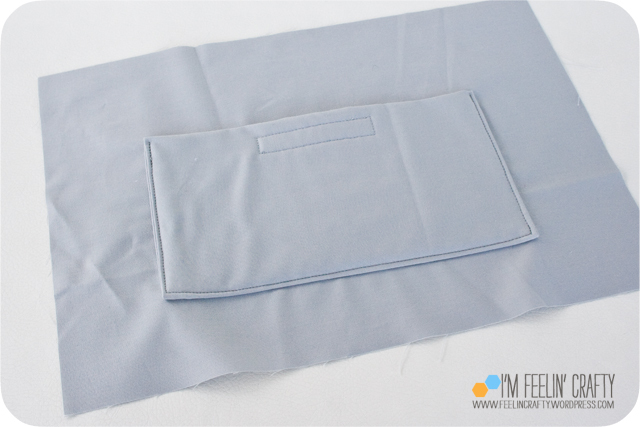 Then iron over and top stitch around the rectangle. Time for the pocket! 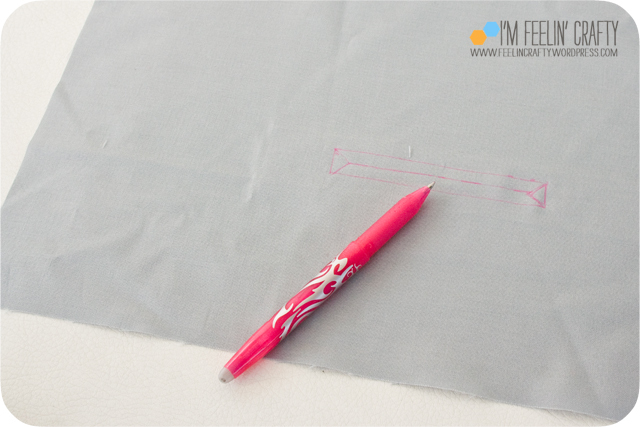 Fold over the fabric (RST), add the batting on top and stitch along the short sides. 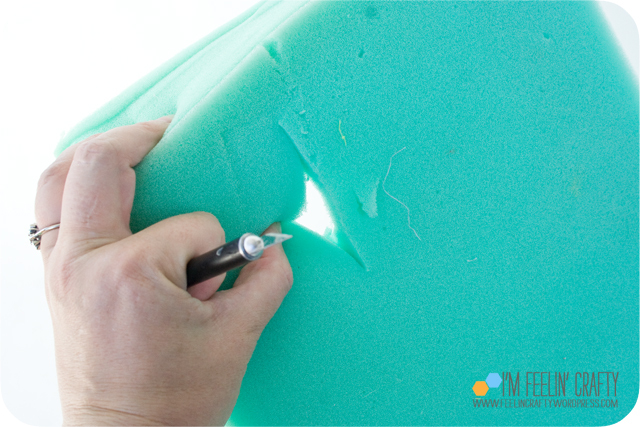 Trim the bottom with pinking shears and snip the top corners. 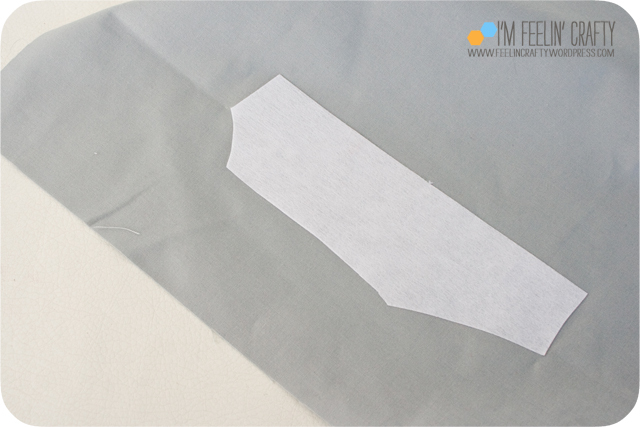 Turn right sides out, iron flat and fold over the bottom. Sew on the velcro to the pocket and the pillow back. 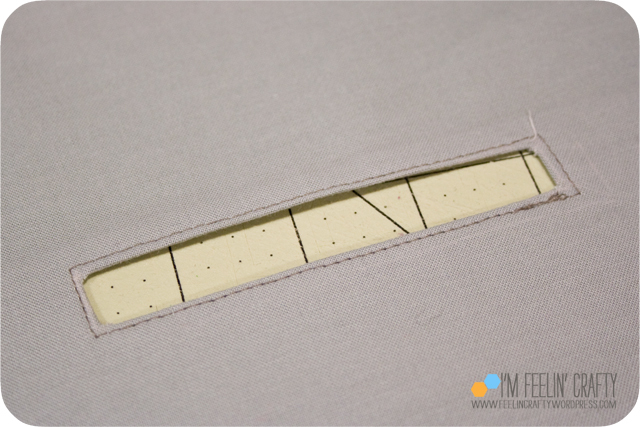 Then sew on the pocket to the back of the pillow, covering the hole you just made. And the sides! 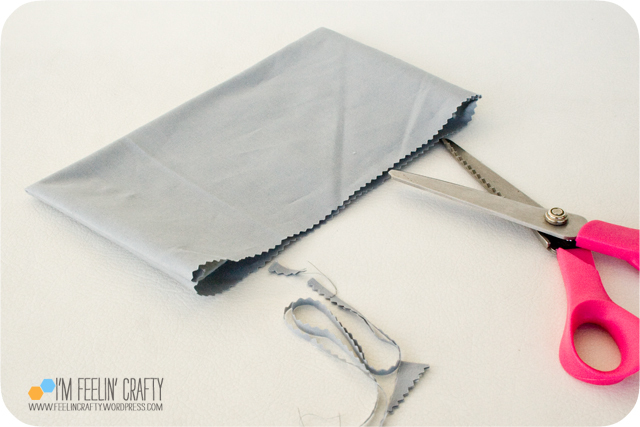 Sew the two skinny pieces of the fabric to the zipper, using a zipper foot, and iron flat. 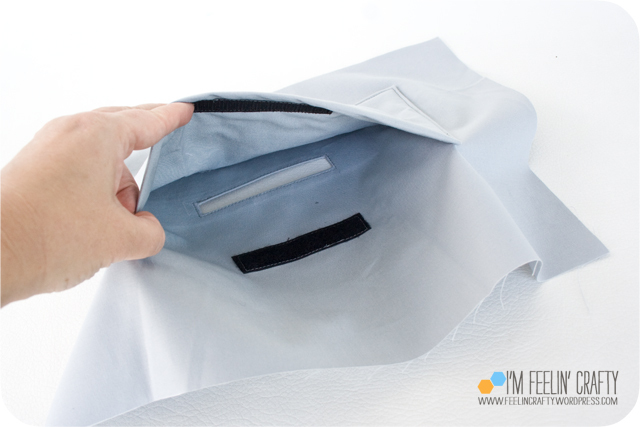 Sew the zipper piece and the side piece together. Then, to get the best fit, I wrapped the piece around the pillow and marked exactly where the other ends get sewn together. 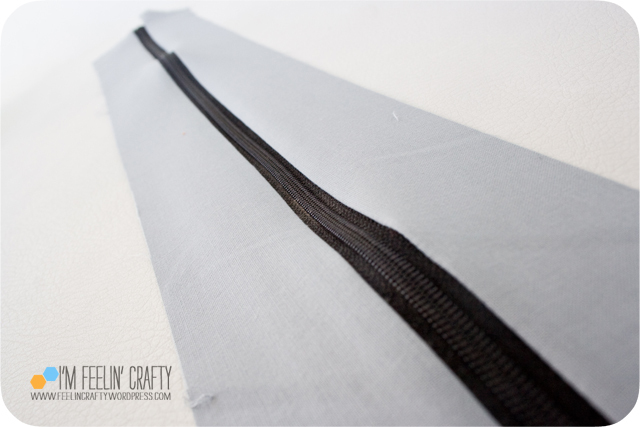 I overlapped the zippered by one inch on each side. This helps with getting the cushion into the pillow case! 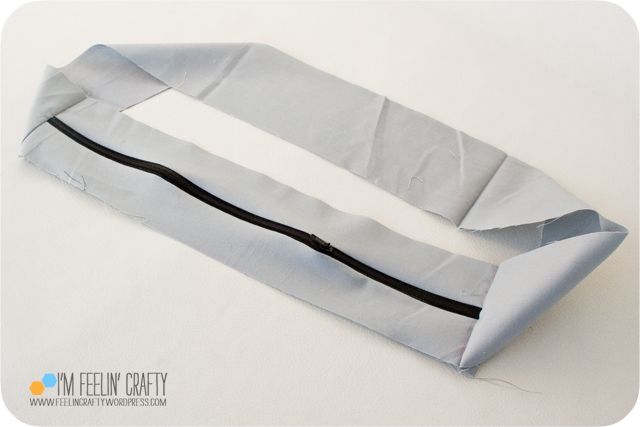 Sew together the black fabric to make the antenna. And stuff it! Prepare the pillow! 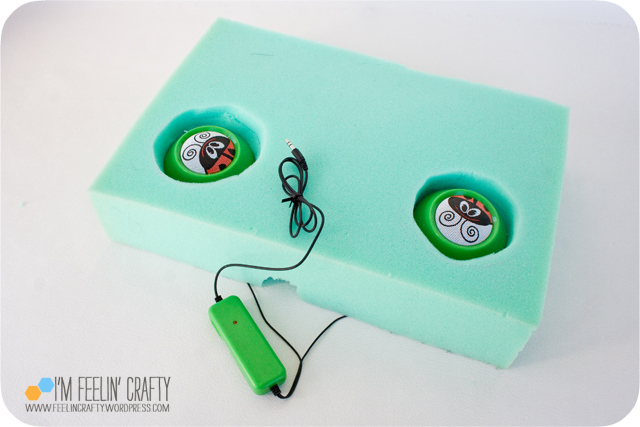 Carve out a spot for for the speakers. It doesn’t have to be pretty! Then cut a slit to slide the speakers through. 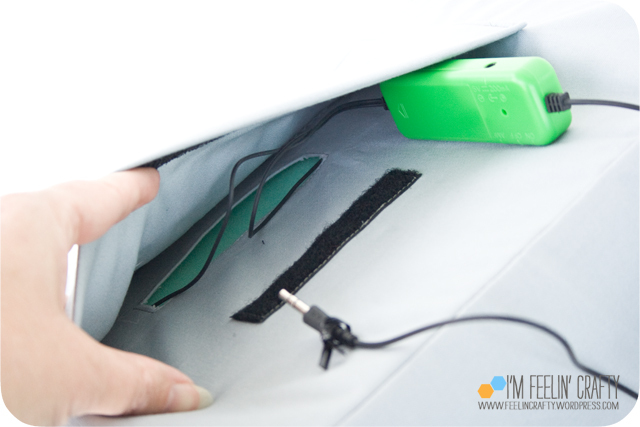 Sew together the top, bottom and sides, RST. Turn right side out. This is where I decided to sew on the strap to the top for the handle! Then insert the pillow! You’re done! Just like in the old days, namin’ that tune!